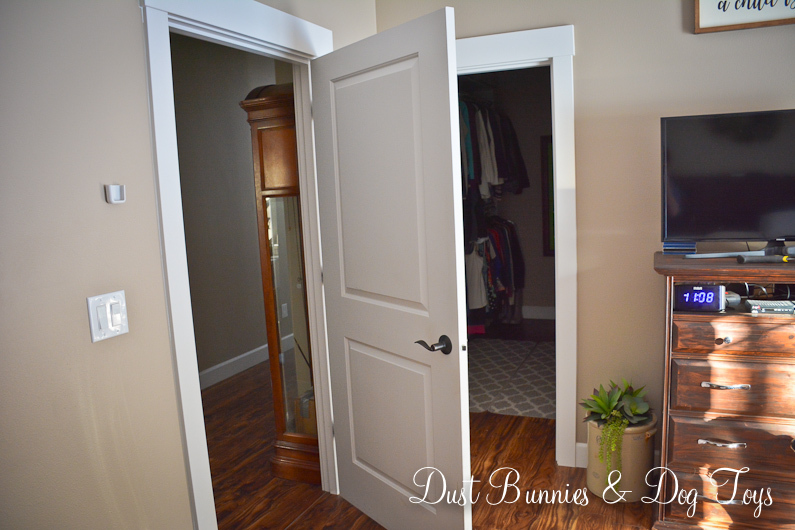 We recently made a very simple change in our master bedroom that had way more impact than we ever imagined. 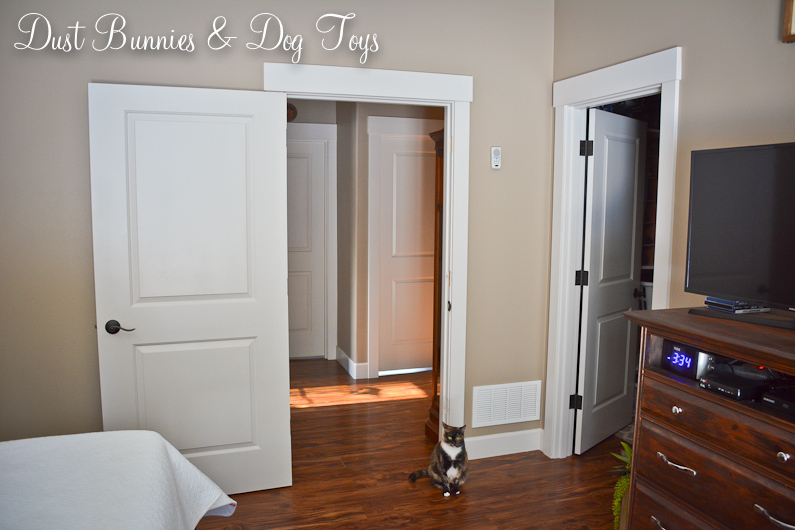 We’ve wanted to flip the direction our bedroom door swings since we saw the model of our floor plan. In fact, it was one of the two changes we requested of the builder, but by the time we noticed it hadn’t been done how we asked it was too late to change it before the final inspection because it would cover the light switches if we did. So we lived with it for the past 3+ years. It drove us nuts to have to come in and move the door to get to the closet every time we came home or pulled the hampers to do laundry. It’s such a minor, trivial thing but it was an every day thing which made it seem even more annoying. The Hubs decided he’d had enough and did some research online to figure out what he needed to do to swap the direction of the door. He used a template he picked up at Lowes to chisel away the spots where the hinges would attach, starting with an outline of the spot and then creating slices he could work out little by little. Soon he had three indented spots ready for hinges. 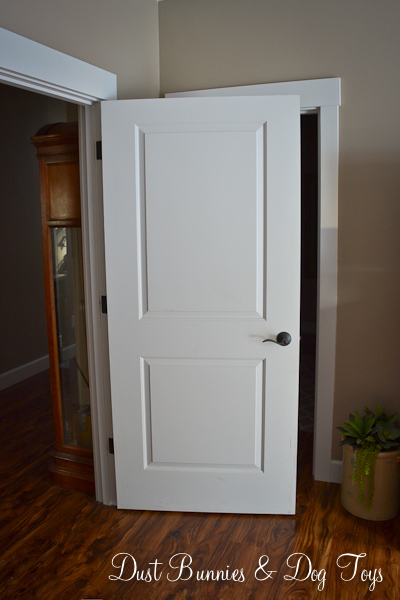 He also had to change up the hinge locations on the door itself so he took the door off and chiseled those areas too. I was working on another project while he was doing this and occasionally held the door steady while he chiseled, so I don’t have any pictures of that step. 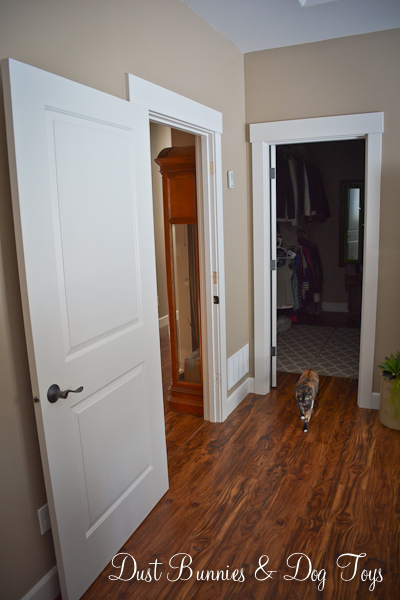 Once he had the new hinge locations prepped and swapped over the hardware we went from this…. …to this! Look how much more open it makes the space feel! Now the door swings back flush against the wall, leaving nothing blocking the entrance to the closet – just how we always wanted it. We left the light switches right were they were because we rarely used them thanks to the remote for our overhead fan/light combo. 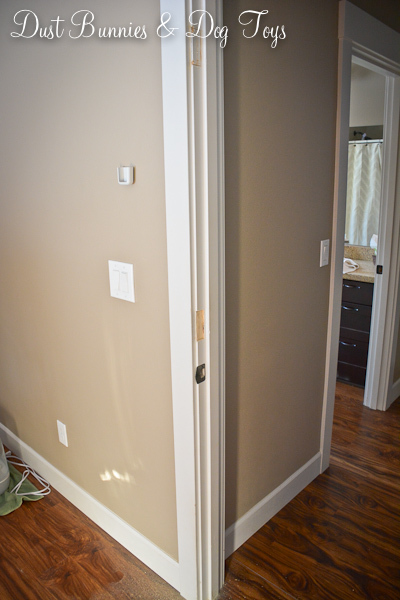 We also have switches for the overhead fixture by the bathroom door so we can always use that instead. The Hubs relocated the holder for our light/fan remote to the open side of the door so we have easy access to that if we want to turn the light off as we leave or on as we enter. 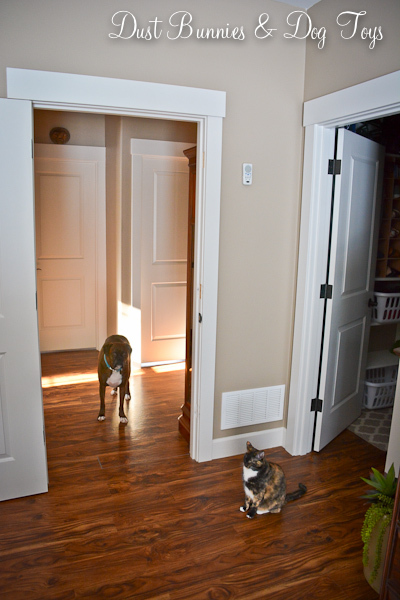 Luna wasn’t too impressed with the change because behind the door was one of her favorite hiding spots, but she’ll just have to be upset because we love it. 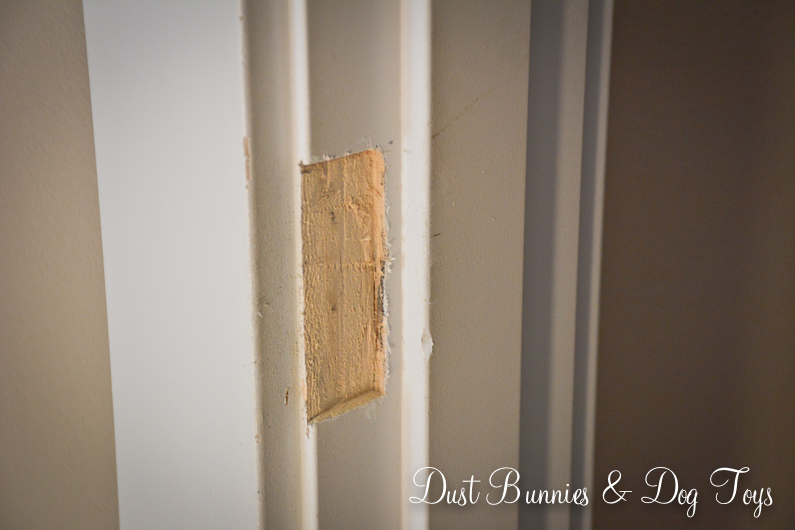 We still need to paint over the old hinge locations to make them blend in, but it’s not a huge priority since you barely notice it. 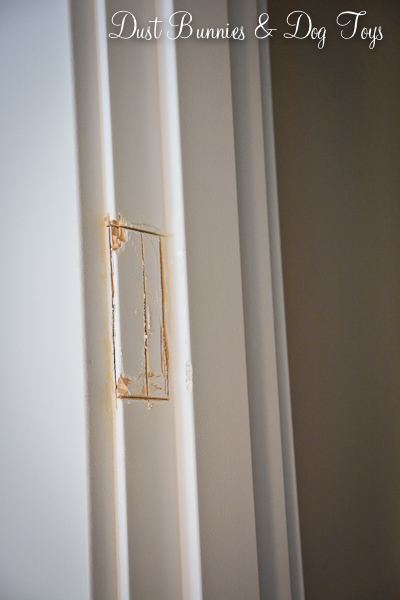 We plan to leave the old indents on the off chance that SHOULD we ever sell this house the next buyer has the option to change it back – if they were crazy and wanted their life to be more difficult that is! Next Checking Out Magnolia Home Locally!